Tunii.com launches site to pay fans to follow and promote music. Seamless integration with Facebook allows anyone with a Facebook account to join for free and earn money sharing music. Tunii.com has launched the first site to pay fans for influencing a song’s success in the market. Tunii.com is free to join and fans pay nothing to participate. The site tracks the success of a song in the market and distributes the song proceeds to everyone involved, the artists, the songwriters, the producers, and for the first time ever, the fans. Now they can thanks to Tunii's patent-pending innovations. Artists release their songs through Tunii, allowing the site to track all sales and influencers, the fans who follow and promote the songs. The site is seamlessly integrated with Facebook and Youtube, so joining the site just takes a couple of quick clicks. Then fans can browse the artists to pick the ones they want to follow and promote. When the songs sell on platforms like Amazon and itunes, the fans get a portion of those earnings. "It's faster and easier to release a song through us," Harrison says. "The fans immediately start following it and promoting it." 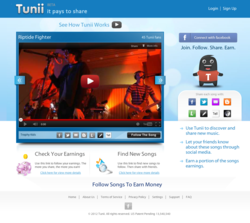 Tunii.com rewards fans for following and promoting songs. Tunii crowd-sources the cost of promoting new music, eliminating the need for large companies to provide capital to push artists and bands. With Tunii.com, the fans provide the marketing mojo that an artist needs to be successful, with more efficiency and with no debt incurred by the artist. There are no long term contracts that restrict an artist’s options, so the upside to musicians is clear. They get all the benefits of Tunii without giving away their publishing rights, leaving them fully in control of their work’s true potential. Some of the artists to be early adopters of Tunii.com include Brett Burke, Trophy Kids, The Dreaming Society, Luna 13, After, Flava Hype, and Sovern.